I'll be honest with you: I wanted to read the book just because of the intriguing title. Unfortunately the rest of the book was less interesting. 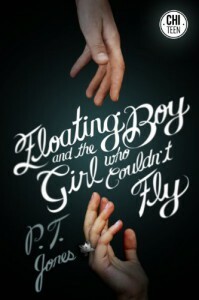 The story starts at a birthday party where, all of a sudden, a boy starts floating (or more like flying). First it is said to be an hoax, until all children that were on the party start floating themselves. The adults for some reason only get flu-like symptoms. And there the special snowflake, Mary (sometimes called Mare, as if that is a better name? ), who's the girl who couldn't fly (on her own at least). What follows is a weird and confusing story. I don't know what to think of it. It felt the whole time like this book should be speaking to me on some higher metaphorical level, but if it did, I didn't get it. Which just left the weird, completely unrealistic (but not in a good way) story. And that wasn't enough to hold my interest, even though this isn't a big book. I was curious however to find out what caused the flying. One moment they say engineered protein, the next it's a virus. (And a flu-shot is all nice, but won't prevent you from getting viruses that cause flu-like symptoms but aren't the flu! A scientist should know these things! ).